The New Kingdom is known as the golden age of ancient Egyptian history. The golden age of the New Kingdom created huge prosperity for Egypt and allowed for the proliferation of monumental architecture. The New Kingdom is known as the golden age of ancient Egyptian history and is the period of Hatshepsut, Tutankhamun, Ramses II, and other famous pharaohs. The wealth gained through military dominance created huge prosperity for Egypt and allowed for the proliferation of monumental architecture, especially works that glorified the pharaohs’ achievements. Starting with Hatshepsut, buildings were of a grander scale than anything previously seen in the Middle Kingdom. Luxor Temple is a large temple complex located on the east bank of the Nile River in what was ancient Thebes (today the city of Luxor). There are six great temples: four on the left bank known as Goornah, Deir-el-Bahri, the Ramesseum, and Medinet Habu; and two on the right bank known as the Karnak and Luxor. The Luxor temple was built with Nubian sandstone from south-western Egypt. Like other Egyptian structures, common techniques were the use of symbolism and illusionism. For example, a sanctuary shaped like an Anubis Jackal was used as a representational symbol of Anubis. To emphasize height and distance and enhance an existing pathway, two obelisks flanking the entrance were built with the illusion that they were the same height—even though they weren’t. This complex is comprised of a vast mix of decayed temples, chapels, pylons, and other buildings. An ancient place of worship for the god Amun, it was part of the monumental city of Thebes. Today, the complex is a vast open-air museum and the largest ancient religious site in the world. The complex consists of four main parts: the Precinct of Amun-Re, the Precinct of Mut, the Precinct of Montu, and the Temple of Amenhotep IV. The Precinct of Amun-Re, also referred to as the Temple of Amun, is the largest of the temples and the only one open to the public today. The columns of its Hypostyle Hall imitate lotus plants and contain elaborate sunken relief. A panorama of the great hypostyle hall at Karnak: The Precinct of Amun-Re is part of the great temple complex at Karnak. Almost every pharaoh of that dynasty has added something to the temple site. It features large sandstone columns, several colossal statues, and one of the largest obelisks, weighing 328 tons and standing 29 meters tall. Many of the walls were decorated with richly ornamented friezes. A panorama of a frieze in the Precinct of Amun-Re: Great monuments and temples were often decorated with elaborate relief sculpture during the New Kingdom. Located to the south of the newer Amen-Re complex, the Precinct of Mut was dedicated to the mother goddess Mut. Hapshepsut helped to restore the original precinct, which had been ravaged during the Hyksos occupation, and had twin obelisks erected at the entrance to the temple; one still stands as the tallest surviving ancient obelisk in the world. The precinct has several smaller temples associated with it and has its own sacred lake, constructed in a crescent shape. Six hundred black granite statues were found in the courtyard to her temple, possibly the oldest portion of the site. The smaller Precinct of Montu is dedicated to the war-god of the Theban Triad, Montu, and is located to the north of the Amun-Re complex. The Temple of Amenhotep IV was located east of the main complex and was destroyed immediately after the death of its builder, so its full extent and layout is currently unknown. By this time, pyramids were no longer built by kings, but they continued to build magnificent tombs. This renowned valley in Egypt is where, for a period of nearly 500 years, tombs were constructed for the Pharaohs and powerful nobles of the New Kingdom. The valley is known to contain 63 tombs and chambers, the most well known of which is the tomb of Tutankhamun (commonly known as King Tut). Despite its small size, it is the most complete ancient Egyptian royal tomb ever found. In 1979, the Valley became a World Heritage Site, along with the rest of the Theban Necropolis. Colonnaded design of Hatshepsut temple: Hatshepsut’s temple is most famous for its Djeser-Djeseru, a colonnaded structure of such architectural skill that predates the Parthenon by nearly one thousand years. The Temple of Hatshepsut was Hatshepsut’s mortuary temple and was the first to be built in the area. The focal point of the tomb was the Djeser-Djeseru, a colonnaded structure of perfect harmony that predates the Parthenon by nearly one thousand years. Built into a cliff face, Djeser-Djeseru, or “the Sublime of Sublimes,” sits atop a series of terraces that once were graced with lush gardens. Funerary goods belonging to Hatshepsut include a lioness “throne,” a game board with carved lioness head, red-jasper game pieces bearing her title as pharaoh, a signet ring, and a partial shabti figurine bearing her name. Painted walls in the burial chamber of Tutankhamun’s tomb, Valley of the Kings, Egypt (late 14th century BCE): Tutankhamun’s burial chamber contained beautiful works of art, text, and hieroglyphics. Tutankhamun was an Egyptian pharaoh of the Eighteenth Dynasty, who ruled from around 1332 BC to 1323 BCE. Popularly referred to as “King Tut,” the boy-king took the throne when he was nine and ruled until his early death at age nineteen. Tutankhamun was buried in a tomb that was small relative to his status. His death may have occurred unexpectedly, before the completion of a grander royal tomb, so that his mummy was buried in a tomb intended for someone else. His mummy still rests in his tomb in the Valley of the Kings, though is now on display in a climate-controlled glass box rather than his original golden sarcophagus . Relics and artifacts from his tomb, including his pectoral jewels and a red granite lion, are among the most traveled artifacts in the world. The Tomb of Nefertari, the most famous of Ramses’s consorts, is also located in the Valley of the Kings and is known for its magnificent wall paintings. The Ramesseum was the great mortuary temple of Ramses II. An enormous pylon representing scenes of the great pharaoh’s reign stood before one of the opening courts, with the royal palace at the left and a gigantic statue of the king looming up at the back. Scattered remains of two statues of the seated king can be seen, one in pink granite and the other in black granite, which once flanked the entrance to the temple. Thirty-nine out of the 48 columns still stand in the hypostyle hall, and part of the gold-and-blue decorated ceiling has also been preserved. 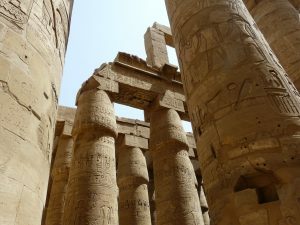 Ramesseum courtyard: The design of Ramses’s mortuary temple adheres to the standard canons of New Kingdom temple architecture. Oriented northwest and southeast, the temple itself comprised two stone pylons (gateways, some 60 m wide), one after the other, each leading into a courtyard. The ancient temples in Thebes were transformed to reflect honor to Ramses’s power. Later, Ramses moved the capital of his kingdom from Thebes to the newly established city of Pi-Ramses, which he used as a main base for his campaigns. Dominated by huge temples and the king’s vast residential palace, it was complete with its own zoo. 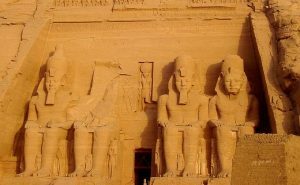 Ramses constructed the complex of Abu Simbel and is perhaps best known for his mortuary temple known as the Ramesseum. After his death, he was buried in a tomb in the Valley of the Kings; his body was later moved to a royal cache , where it was discovered in 1881. It is now on display in the Cairo Museum. The Book of the Dead is the modern name of an ancient Egyptian funerary text, used from the beginning of the New Kingdom (around 1550 BCE) to around 50 BCE. 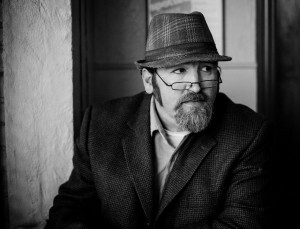 The original Egyptian name is translated as “Book of Coming Forth by Day,” or “Book of Emerging Forth into the Light.” According to ancient Egyptian beliefs, it was the ba (the free-ranging spirit aspect of the deceased) that went “forth by day” into the underworld and afterlife, while the ka (life force) remained in the tomb. Despite the word “book” in the common title, the Book of the Dead was actually printed on scrolls, as opposed to bound texts. The text, placed in the coffin or burial chamber of the deceased, consisted of magic spells intended to assist a deceased person’s journey through the Duat, or underworld, and into the afterlife. At present, some 192 spells are known, though no single manuscript contains all of them. The spells served a range of purposes, such as giving the deceased mystical knowledge in the afterlife, guiding them past obstacles in the underworld, or protecting them from various hostile forces. 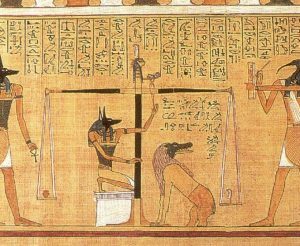 In total, the spells in the Book of the Dead provide vital information regarding ancient Egyptian beliefs on death, interment, and the afterlife. The Book of the Dead was part of a tradition of funerary texts which includes the earlier Pyramid Texts of the Old Kingdom and the Coffin Texts of the Middle Kingdom. However, it differed from its predecessors in many ways. For instance, Pyramid Texts were written in an unusual hieroglyphic style , were exclusive to those of royal privilege, and saw the afterlife as being in the sky. The Coffin Texts used a newer version of the language, included illustrations for the first time, and were available to wealthy private individuals. Both were painted onto walls or objects in the funerary chamber. The Book of the Dead, in contrast , was painted on expensive papyrus, written in cursive hieroglyph, and saw the afterlife as being part of the underworld. The earliest examples developed towards the beginning of the Second Intermediate Period, around 1700 BCE, and included new spells among older texts. By the Seventeenth Dynasty , the spells were typically inscribed on linen shrouds wrapped around the dead, though occasionally they are found written on coffins or on papyrus. The New Kingdom saw the Book of the Dead develop and spread further. The famous “Spell 125,” the Weighing of the Heart, is first known from the reign of Hatshepsut and Tuthmose III (c.1475 BCE). In “Spell 125,” the heart of the deceased must be weighed against the Feather of Truth before the deceased can pass into the afterlife. The jackal-headed god Anubis weighed the heart, while the ibis-headed god Thoth recorded the results. A heavy heart indicated sin and resulted in the deceased being devoured by a crocodile-like creature named Ammit. On the other hand, a lightweight heart equal with the weight of the feather allowed the deceased to enter the afterlife and enjoy an eternity that, although plentiful, required manual labor. For this reason, the Book of the Dead included spells for statuettes called shebti (later ushebti) to perform in the deceased’s place. From the fourteenth century BCE onward, the Book of the Dead was typically written on a papyrus scroll and the text was illustrated with elaborate and lavish vignettes. Later in the Third Intermediate Period, the Book of the Dead started to appear in hieratic script as well as in the traditional hieroglyphics. The last use of the Book of the Dead was in the first century BCE, though some artistic motifs drawn from it were still in use in Roman times. 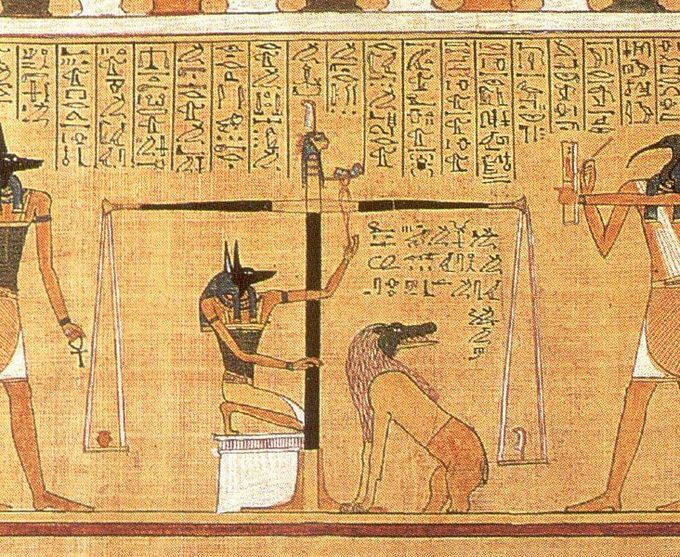 The Weighing of the Heart: In Spell 125, Anubis weighs the heart of Hunefer. This spell is first known from the reign of Hatshepsut and Tuthmose III, c. 1475 BC. There was no single Book of the Dead, and works tended to vary widely. Some people seem to have commissioned their own copies, perhaps choosing the spells they thought were most vital in their own progression to the afterlife. Later in the Twenty-Fifth and Twenty-Sixth Dynasties, however, the Book was revised and standardized, with spells consistently ordered and numbered for the first time. Books were commissioned by people in preparation for their own funeral, or by the relatives of someone recently deceased. They were written by scribes, and sometimes the work of several different scribes was literally pasted together. Composed of joined sheets of papyrus, the dimensions of a Book of the Deadcould vary from one to 40 meters. Books were often prefabricated in funerary workshops, with space left for when the name of the deceased would be written in later. Cursive hieroglyphs from the Papyrus of Ani: During the New Kingdom, the Book of the Dead was typically written in cursive hieroglyphs. 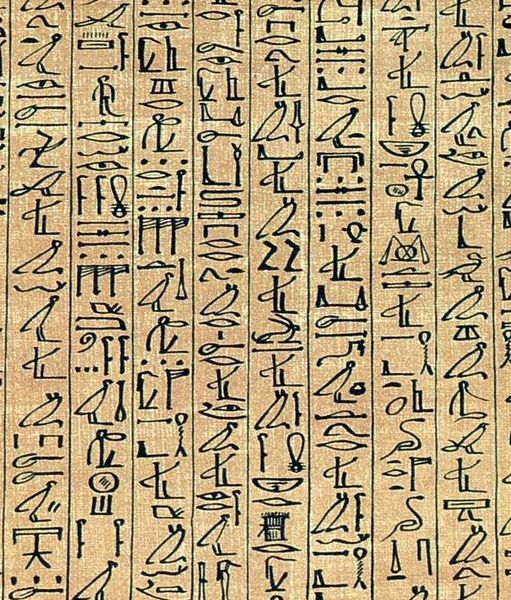 The text of a New Kingdom Book of the Dead was typically written in cursive hieroglyphs, most often from left to right, but also sometimes from right to left. 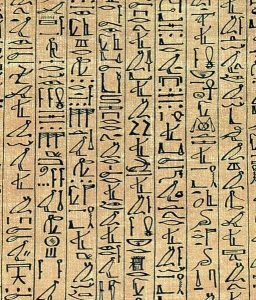 The hieroglyphs were in columns separated by black lines , and illustrations were put in frames above, below, or between the columns of text. The text was written in both black and red ink from either carbon or ochre , respectively. The style and nature of the vignettes used to illustrate a Book of the Dead varies widely: some contain lavish color illustrations, even making use of gold leaf , while others contain only line drawings or a simple illustration at the opening. Sculpture in the New Kingdom continued in the traditional Egyptian style , with many great works produced by pharaohs over the years. However, during the later Amarna period, it underwent a drastic shift in style to emphasize more naturalistic (and less idealistic) human figures, such as those with drooping bellies. While reliefs and sculptures in the round continued to be painted, the skin tones of male and female figures was now the same value of brown. Some scholars believe that the shift was due to a new group of artists whose training was different from those trained in the traditional methods at Karnak. Detail of Hatshepsut (c. 1473–1458 BCE): Hatshepsut is depicted in the clothing of a male king, though with a feminine form—differing from the Osirian statues in which she appears much more androgynous. Hatshepsut’s (1508–1458 BCE) construction of statues was so prolific that, today, almost every major museum in the world has a statue of hers among their collections. While some statues show her in typically feminine attire, others depict her in the royal ceremonial attire. The physical aspect of the gender of pharaohs was rarely stressed in the art, and with few exceptions, subjects were idealized. The Osirian statues of Hatshepsut, located at her tomb, follow the Egyptian tradition of depicting the dead pharaoh as the god Osiris. However, many of the official statues commissioned by Hatshepsut show her less symbolically, and more naturally, as a woman in typical dresses of the nobility of her day. Colossal statues of Ramses II outside of Abu Simbel: This famous work depicts four repeating statues of Ramses II, following the tradition of deifying pharaohs. Statues typically depicted Egyptian pharaohs, often representing them as gods. In the famous sculptures outside the main temple at Abu Simbel, Ramses II (1303–1213 BCE) is depicted in a row of four colossal statues. Other deities are frequently shown in paintings and reliefs. Most of the larger sculpture survives from Egyptian temples or tombs, where massive statues were built to represent gods and pharaohs and their queens. The style of sculpture shifted drastically during the Amarna Period in the late Eighteenth Dynasty , when Pharaoh Akhenaten moved the capital to the city of Amarna. This art is characterized by a sense of movement and activity in images, with figures having raised heads, many figures overlapping, and many scenes full and crowded. Sunken relief was widely used. Figures are depicted less idealistically and more realistically, with an elongation and narrowing of the neck; sloping of the forehead and nose; prominent chin; large ears and lips; spindle-like arms and calves; and large thighs, stomachs, and hips. For example, many depictions of Akhenaten’s body show him with wide hips, a drooping stomach, thick lips, and thin arms and legs. This is a divergence from the earlier Egyptian art which shows men with perfectly chiseled bodies, and there is generally a more “feminine” quality in male figures. Some scholars suggest that the presentation of the human body as imperfect during the Amarna period is in deference to Aten. 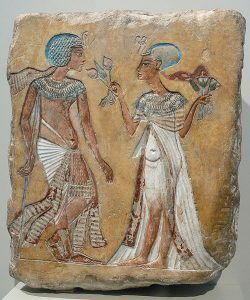 Artist’s sketch: Walk In The Garden; limestone, New Kingdom, 18th Dynasty, c. 1335 BC: A relief of a royal couple in the Armana style. 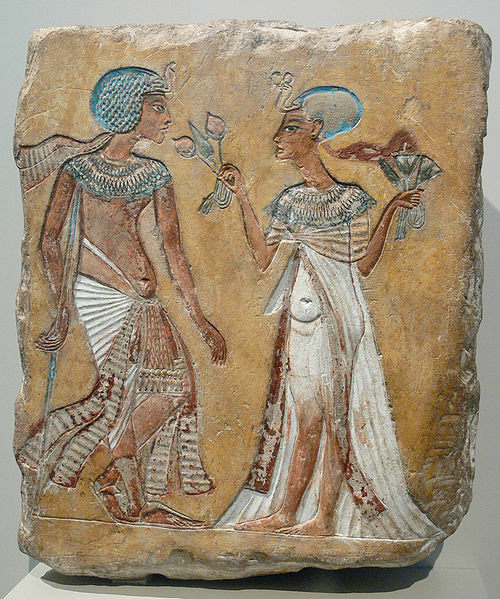 The figures are thought to be Akhenaten and Nefertiti, Smenkhkare and Meritaten, or Tutankhamen and Ankhesenamun. Like previous works, faces on reliefs continued to be shown exclusively in profile. The illustration of figures’ hands and feet showed great detail, with fingers and toes depicted as long and slender. The skin color of both males and females was generally dark brown, in contrast to the previous tradition of depicting women with lighter skin. Along with traditional court scenes, intimate scenes were often portrayed. In a relief of Akhenaten, he is shown with his primary wife, Nefertiti, and their children in an intimate setting. His children are shrunken to appear smaller than their parents, a routine stylistic feature of traditional Egyptian art. Relief portrait of Akhenaten (c. 1345 BCE): Akhenaten represented in the typical Amarna period style. While the religious changes of the Amarna period were brief, the styles introduced to sculpture had a lasting influence on Egyptian culture. Painters for much of the New Kingdom continued to depict the human figure in largely the same manner as their predecessors in previous eras. 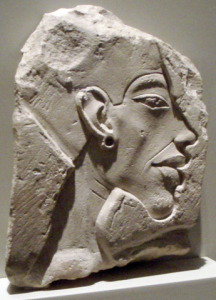 A significant change, however, occurred during the Amarna Period under the pharaoh Akhenaten (r. 1351–1334 BCE), when the body assumed a less idealized form . While many theories exist as to why this change occurred, the exact reason remains unknown. The tomb known as TT52 houses an official named Nakht and his wife Tawy (14th century BCE). Among the decorations are richly colored paintings that depict the couple in the standard 18 fists-high profile pose, frontal torso, outward palms pose. As in paintings of previous eras, both figures are the same height. Their skin tones also follow the traditions that depict men with dark brown skin and women with light yellow skin. Nakht and Tawy making an offering: The figures in this painting continue the conventions established during the Early Dynastic Period. Elsewhere in the tomb, Nakht assumes a more dynamic (albeit still stylized) pose as he hunts and fishes, a convention that also follows the style established during the Early Dynastic Period. Nakht hunting and fishing in the afterlife: The figures in these paintings convey a sense of dynamism, albeit still stylized as in the past. During the New Kingdom, religious scenes comprise the majority of paintings in the tombs of the elite. This trend, echoed in the decorative objects in these tombs, is evident in the painting of Nakht and Tawy making an offering . However, scenes from everyday life, such as hunting and fishing, remain an important part of the imagery. Akhenaten’s daughters: Following the conventions of the Amarna Period, the figures in this painting have protruding bellies, overlap one another, and appear more relaxed than figures in previous eras. Although the depicted figures are girls, their skin tone is the same as their male counterparts. Art from this period is characterized by a sense of increased movement and activity in images, with busy and crowded scenes and many of the figures overlapping. Male and female figures are depicted with the same dark brown skin tone, a departure from the past in which women are depicted with lighter skin tones. The human body is portrayed more realistically, rather than idealistically, though at times depictions border on caricature. For example, many depictions of Akhenaten’s body show him with wide hips, a drooping stomach, thick lips, and thin arms and legs. This is a divergence from the earlier Egyptian art which shows men with perfectly chiseled bodies, and there is generally a more “feminine” quality in male figures. Some scholars suggest that the presentation of the human body as imperfect during the Amarna period is in deference to the Aten. Although many non-elite tombs from the New Kingdom were plundered, leaving few images and objects for modern scholars to study, it is evident that the decoration was quite different from previous eras. These tombs did not feature any funerary or agricultural scenes. Images of the tomb occupant were also absent, with the exception of instances in which he or she was depicted with a member of the royal family. Decorations from the Amarna Period clearly worshiped the Aten, with excerpts from the Hymn to the Atenoften present in the tombs. There is an absence of other gods and goddesses and no mention of Osiris or the underworld. This entry was posted in Ancient, Architecture, Art History, Egypt, Egyptian, History. Bookmark the permalink.